Do you have a compelling vision for a story set in the past? Are you inspired by novelists such as Alan Furst and Philippa Gregory? Get Started in Writing Historical Fiction is designed for anyone who wants to write in this exciting and wide-ranging genre of fiction, whatever your favorite style and era. 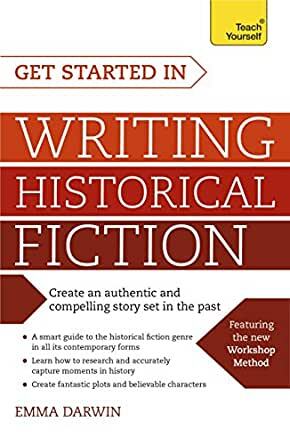 Designed to build your confidence and help fire up creativity, this book is an essential guide to mastering the practicalities of writing historical fiction, showing you where to start with research, developing your plots, and convincingly and imaginatively capturing the voices of the past. Using Snapshots designed to get you writing quickly, Key Ideas to help crystallize thought, and a wealth of supplementary materials, this indispensable guide will have you telling amazing and rich historical stories in no time. You'll learn to research and plan your story, practice developing characters and settings, perfect your characters' voices, and transport the reader to another era. A comprehensive and intelligent guide to writing historical fiction, with practical tips, exercises, and expert advice. This great grand daughter of Charles has taken great effort in assessing how historic fiction is assembled and how it works when done well. Good exercises, especially on getting into character and the period in which they lived. Guidance for almost all the fiction set in the past and not necessisarily the distant past. This book was helpful to me in indulging in writing historical fiction. This book was an interesting read and did cover a lot of things to do with writing in general. If someone has a paper white touch screen Kindle, like I do, then I would suggest reading the book on a different screen or get the paper back version. The writing being lighter in most of the sections became annoying and spoilt the reading enjoyment. This is the best book of advice for aspiring writers that I've read yet, and I've read a few. The focus is, of course, on historical fiction, with some useful exercises and particular advice on that genre, but there is a lot of solid advice on core aspects of storytelling that are applicable across all genres. The examples, from physic distance to free indirect style to the pros and cons of past vs present tense, are clear and easy to understand. I'm keeping it within easy reach on my desk, along with several other indispensable reference books. And now, having gone through it once, I will have to go through it again, and make notes of all the novels she quoted bits from, to hunt them down and read them myself.